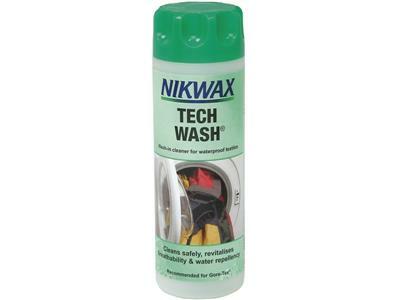 Nikwax Tech Wash is a wash-in cleaner for waterproof clothing . It safely revitalises breathability and water-repellency. This product is a non-detergent soap which can be used regularly to clean waterproof clothing and equipment without damaging the Durable Water Repellent (DWR) coatings. Use this product instead of detergents or washing powder. 2. Place item(s) in washing machine (maximum 2 items). 3. Use 150ml in medium/hard water* areas and 100ml in soft water areas for 1-2 items. 1. Immerse item(s) in hand-hot water in sink or bowl. 2. Use 150ml in medium/hard water* areas and 100ml in soft water areas for 1-2 items. 3. Rinse 3 times in clean water.